Many owl species have developed specialized plumage to effectively eliminate the aerodynamic noise from their wings allowing them to hunt and capture their prey in silence. A research group working to solve the mystery of exactly how owls achieve this acoustic stealth will present their findings at the American Physical Society's (APS) Division of Fluid Dynamics meeting, held Nov. 24 – 26, in Pittsburgh, Pa. work that may one day help bring "silent owl technology" to the design of aircraft, wind turbines, and submarines. "Owls possess no fewer than three distinct physical attributes that are thought to contribute to their silent flight capability: a comb of stiff feathers along the leading edge of the wing; a flexible fringe a the trailing edge of the wing; and a soft, downy material distributed on the top of the wing," explained Justin Jaworski, assistant professor in Lehigh University's Department of Mechanical Engineering and Mechanics. His group is exploring whether owl stealth is based upon a single attribute or the interaction of a combination of attributes. For conventional wings, the sound from the hard trailing edge typically dominates the acoustic signature. 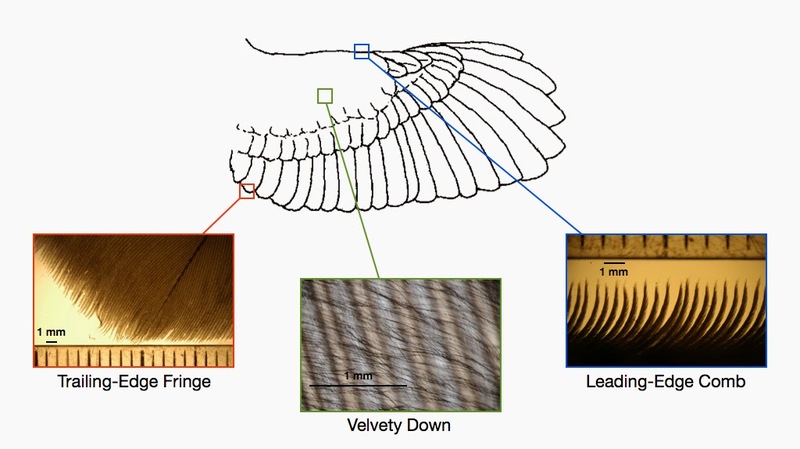 But prior theoretical work carried out by Jaworski and Nigel Peake at the University of Cambridge revealed that the porous, compliant character of the owl wing's trailing edge results in significant aerodynamic noise reductions. "We also predicted that the dominant edge-noise source could be effectively eliminated with properly tuned porous or elastic edge properties, which implies that that the noise signature from the wing can then be dictated by otherwise minor noise mechanisms such as the 'roughness' of the wing surface," said Jaworski. The velvety down atop an owl's wing creates a compliant but rough surface, much like a soft carpet. This down material may be the least studied of the unique owl noise attributes, but Jaworski believes it may eliminate sound at the source through a novel mechanism that is much different than those of ordinary sound absorbers. "Our current work predicts the sound resulting from air passing over the downy material, which is idealized as a collection of individual flexible fibers, and how the aerodynamic noise level varies with fiber composition," Jaworski said. The researchers' results are providing details about how a fuzzy compliant but rough surface can be designed to tailor its acoustic signature. A photographic study of actual owl feathers, carried out with Ian Clark of Virginia Tech, has revealed a surprising 'forest-like' geometry of the down material, so this will be incorporated into the researchers' future theoretical and experimental work to more faithfully replicate the down structure. Preliminary experiments performed at Virginia Tech show that a simple mesh covering, which replicates the top layer of the 'forest' structure, is effective in eliminating some sound generated by rough surfaces. "If the noise-reduction mechanism of the owl down can be established, there may be far-reaching implications to the design of novel sound-absorbing liners, the use of flexible roughness to affect trailing-edge noise and vibrations for aircraft and wind turbines, and the mitigation of underwater noise from naval vessels," said Jaworski.